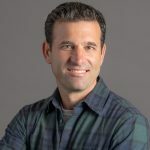 Secondary apartment markets and what we call surban™ locations (desirable suburban locations with urban amenities) have shifted to become outperformers. Secondary markets (determined by historical permit activity) have had less construction than primary markets and remain more affordable. 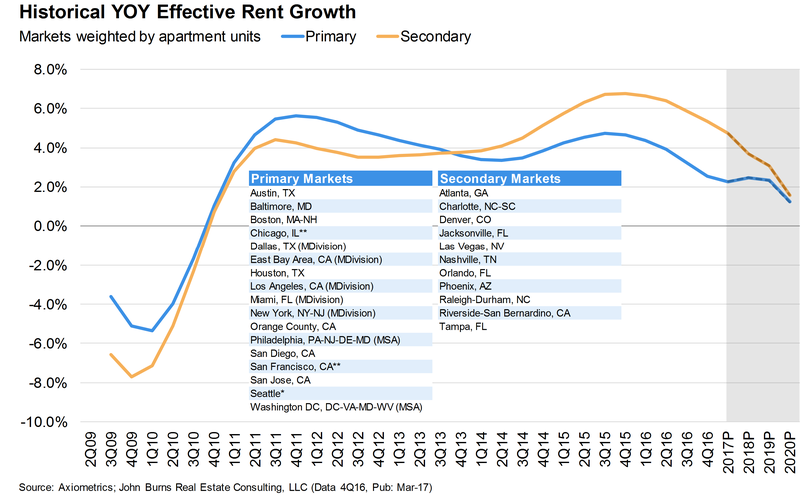 These secondary markets account for the largest current YOY rent growth, and we forecast them to outperform through 2020. Primary markets include larger coastal cities that experienced greater levels of investment and construction earlier in the cycle. We believe the markets below will outperform and underperform over the next several years. Southwest. Fourth quarter rent growth topped 5% in Las Vegas and Phoenix, and we expect rents to rise just under 4% annually through 2020. These markets continue to experience solid job growth and are relatively early in their respective apartment/economic cycles. Southeast. Strong fundamentals define Atlanta, with 4.7% rent growth and 2.7% job growth. Occupancy exceeds historical norms by nearly 1.5%. Charlotte and Raleigh will also outperform with 3%+ annual rent growth through 2020. B-Class California markets. Fourth-quarter rents rose 7% YOY in Riverside/SB, the strongest of any market in the country. Riverside/SB is also one of the few markets where current multifamily construction is below its annual historical average. Housing unaffordability in coastal California is starting to show up in more inland locations, which will benefit apartment demand. The recent expansion of Highway 91 will ease congestion to the job centers. Orlando. The Orlando market outperformed in the fourth quarter with rents up roughly 4% YOY and job growth above 4%, the best in the country. We forecast a 4% annual rent growth from 2017–2020. Tech markets. San Francisco rents dropped 2.3% YOY, and San Jose rents fell 2.5% in the fourth quarter. REIT operators report negative lease growth along with two months of concessions. We expect rents to continue declining over the next several years as a large amount of Class A supply is delivered. Most new supply should be delivered in the second half of 2017. New York City. Rents fell further in Q4, down 0.7% due to a wave of new luxury supply and muted demand. Fundamentals are expected to continue to soften over the next several years due to slower job growth and oversupply. Houston. Landlords in Houston continue to struggle with a historically large pipeline concentrated in energy-dependent / typically higher-end submarkets. Rents fell 3.6% YOY, and occupancy fell 1.7% in the fourth quarter. REIT operators note that concessions remain in the market but are optimistic that the worst is behind. Migration trends can be a great indicator of future apartment demand. The graph below shows the average cost of taking a rental truck to a market from the other 24 markets, less the cost of returning the truck. A positive number implies net in-migration, and a negative number implies net out-migration. The dots compare this year’s premiums to last year’s. 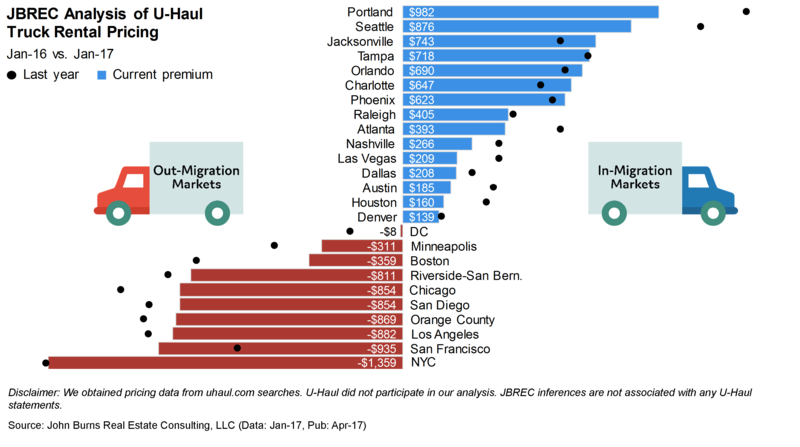 Of the 15 markets with net in-migration, 10 are secondary markets. The secondary markets of Jacksonville, Orlando, Charlotte, and Phoenix all have higher rental truck premiums than last year. Riverside/SB is the only secondary market with net out-migration (negative premium). Double-digit permit increases in 2014–2015 have brought a glut of supply to Class A apartment markets, which will take time to absorb. Going forward, investment capital should be focused in secondary markets which generally have fewer new buildings pressuring rent growth.